Assessing NPR's Recent Venezuela Coverage : NPR Public Editor Some digging may be involved, but NPR is providing multiple perspectives. 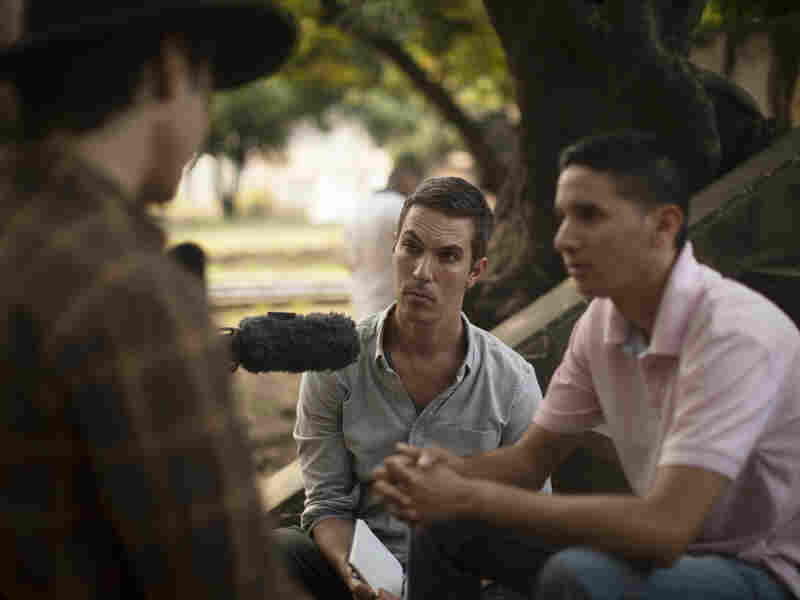 NPR's Ari Shapiro (center) interviews former Venezuelan special forces official Williams Cancino (right) in the Colombian town of Villa del Rosario. NPR reporting on the crisis in Venezuela over the last several months has raised an outsized number of complaints. Are listeners getting the fullest picture of the political turmoil and its contributing factors? Is NPR directly or indirectly, as some listeners believe, helping make the case for White House intervention in the political affairs of another country? This office looked back at several months of the coverage of the international story. The reporting is ongoing: NPR's All Things Considered sent a team to the Venezuelan/Colombian border in March for a series of in-depth reports that continues to air this week. For some audience members, these reports only addressed one concern among many, and sparked some new ones. Venezuela's extraordinarily high inflation rate and troubled economy are not new: NPR has covered these stories for years. But, as the inflation rate continues to rise in the country with the most oil reserves in the world (more on that later), many readers insist that NPR is not doing enough to tell the complete story. As one audience member wrote to the Public Editor's office, "You offer little in the way of history, explaining the economic conditions that prevailed prior to the Bolivarian revolution that placed former military commander Hugo Chavez in office, and even less about the positive reforms the Chavez administration put in place." In effect, this listener (joined by many others) is criticizing specific aspects of NPR's coverage rather than its entirety. Since January, NPR has run more than 200 stories about the country online and in the morning and evening newsmagazines. An assessment of the body of NPR's Venezuela coverage shows many stories that put the current events into historical context. To cite just a couple: NPR's Carrie Kahn and Alex Leff reported that in the last century, the U.S. has participated in Latin American regime changes 40 times. And a recent episode of Planet Money's "The Indicator" used Venezuela's current hunger crisis to look at the last two decades of Venezuela's pivot to depending on an economy underpinned by oil — a move put in motion by Chavez. But unlike text stories on the Web, radio reporter pieces and live interviews are bound by strict time limits, which sometimes leaves audience members frustrated at the lack of context included. Time is tight. A two-minute story can cover the day's news, but does not allow for an explanation of the contributing factors of the last 50 years. That's no different than when NPR covers any other complex ongoing story. But there's a broader issue, too. NPR's Will Dobson, supervising senior editor on the international desk, said that along with time constraints on radio reporting, the challenge lies with a "disagreed history." While the facts surrounding Venezuela's historical events are straightforward, the interpretation of these events is not. For example, many listeners have complained about NPR's use of the phrase "self-proclaimed president" to refer to Guaidó, with some audience members criticizing the "self-proclaimed" portion and others questioning anything that seems like NPR's affirmation of Guaidó as "president." "It's not [about] giving context," said Dobson of the criticism. "It's reconciling world views." One newsmagazine piece that drew feedback from audience members was NPR's interview of special envoy Elliott Abrams, President Trump's appointee to handle matters in Venezuela. Prior to that interview, NPR covered a House committee hearing where lawmakers asked Abrams about his involvement in the Iran-Contra affair more than three decades ago. During February and March, NPR heard from Latin America experts who argued that U.S. military intervention would not lead to the regime change the Trump administration supports. In the Abrams interview alone, the full picture might have been difficult to see. Abrams was asked about and laid out, sometimes vaguely, the administration's strategy in Venezuela. His controversial past was acknowledged as a point of contention at the end of the interview. Abrams offered one point of view — one that many listeners disagree with, vehemently — and the interview was conducted respectfully, which is NPR's style. NPR interviews of political figures and government officials such as Abrams are necessary. They help listeners understand the whole picture and get officials on the record about their actions. A broader theme running through the many audience concerns is the assumption that the Trump administration is preparing to invade Venezuela — and that NPR's reporting of the situation echoes the lack of critical media coverage prior to the 2003 invasion of Iraq. All Things Considered's Ari Shapiro told me that this history was actually a central reason for the newsmagazine's reporting trip to Colombia's border with Venezuela. The teams' stories, some of which ran a lengthy 11-plus minutes, have taken different vantage points: a pregnant woman seeking medical assistance across the Venezuelan border in Colombia; the young men ready to overthrow Maduro using violence; and the perilous journey of the caminantes — those walking hundreds of miles to flee Venezuela. "It's the biggest refugee crisis outside of Syria," said Shapiro. "And there are concerns that it could be the next U.S. military intervention." To prepare for the trip, the reporting team conducted dozens of background interviews, seeking input from professors, other journalists, government officials, people in Venezuela and more. "For this, we wanted to hear the voices on the ground," said Shapiro. "We wanted to bring listeners to a place and let them experience what it was like being in the city of Cúcuta, being on the road to Bogota with the walkers, the 'caminantes.' We wanted to bring a lot of rich voices and sounds." Some listeners said that by highlighting the humanitarian crisis, NPR was in effect adding support to the Trump administration's efforts to oust Maduro. But these kinds of eyewitness reports are crucial for the audience to fully understand the situation. A final point of criticism levied against NPR is the range of voices represented. NPR audience member Nancy Slator of Western Massachusetts wrote: "Day after day the programs interview anti-Maduro people, and I have never heard from the side that supports Maduro. The anti-Maduro people freely say the pro-Maduro people are corrupt, and the hosts just agree with them rather than reporting evidence on the question." While no listener can hear every report, opposition voices have outnumbered those of Maduro supporters in NPR's reporting. But NPR's Philip Reeves, who covers Latin America, has pulled in a few pro-Maduro voices, including a member of the civilian militia, a former banker and a retired member of Venezuela's National Guard. And NPR's Eyder Peralta has also included voices from inside the Venezuelan government and of Chavez supporters. The reason for any imbalance is not, as some listeners argued, that NPR doesn't want to report what Maduro's supporters have to say. "That's the most fascinating part of the story here," said Dobson. "We want to plunge the depths of the pro-Maduro supporters." But Dobson said NPR's responsibility to keep its journalists and sources safe is the top priority, and reporting safely from Venezuela is extremely difficult. Venezuela ranks 143 out of 180 countries in press freedom, with journalists risking violence at the hands of the state and some of its supporters. New York Times journalist Nicholas Casey spoke about the challenges last week on Fresh Air, and some local journalists have moved their base to Colombia to continue operating safely. In approaching NPR's coverage of Venezuela, it's important to acknowledge that there are many storylines and facts that are not mutually exclusive: Maduro's repression of the opposition, the Venezuelan economy in free fall, a long history of U.S. intervention in Latin American affairs, oil sanctions imposed by the U.S. and its subsequent backing of opposition leader Guaidó — all of this exists simultaneously. So, reporting on allegations of crimes against humanity in Venezuela has not stopped NPR from simultaneously reporting on the moves of the U.S. government. The U.S. is Venezuela's biggest oil customer. Under the Obama and Trump administrations, the U.S. placed sanctions on Venezuelan oil, adding to Venezuela's declining economy. In January, U.S. Treasury Department announced sanctions that virtually stopped imports from the Latin American country completely. The question becomes whether reporting through interviews to hear from those directly involved is conducive to communicating every fact that the audience needs to know in the time available for radio reports. What level of knowledge should NPR expect a typical audience member to have about the situation? How can reporting of current news also take account of decades of historical context surrounding U.S. intervention in Latin America? The answer to the last question is: It depends. Back to chief international desk editor Will Dobson: "Sometimes the history can be included in pieces of greater length, and sometimes that isn't possible." I think NPR's body of coverage for Venezuela is composed of quality work. The reporting from Caracas and the Venezuelan-Colombian border has been strong and added to the audience's understanding of a complex story. NPR's breaking news on in-country events has not always been expeditious. For example, the npr.org story on the first massive power outage in Venezuela came some 18 hours after the reported incident. But the next day's reporting offered an in-depth look at events that went beyond a breaking-news banner with a few thin paragraphs. A large portion of the concerns audience members have expressed to this office are calls for NPR to adhere to the basic tenets of journalism: completeness, fairness and independence, which are all described in NPR's Ethics Handbook. And when reporting on a country where the press is openly threatened, the need for this high-quality journalism is even greater. But to produce it, journalists have to be safe, and media organizations have to be responsible. Reviewing NPR's coverage of Venezuela, it's clear to me that neither the U.S. nor the Venezuelan government represents the dichotomy of "good" and "bad." The history is messy and the current events are getting messier. While it may be easier for some to see those two parties as representing such a dichotomy, it doesn't do justice to the realities at play and to the Venezuelans whose lives are affected by the crisis in that troubled country.